It’s been a long time since I started playing Stardew Valley on my PC and it resembled to be very addictive. And still, I play the game but on Nintendo Switch. While looking at the list of games, I found some similar games like Stardew Valley, which are also addictive and fun to play. So I thought I should share it with other people who like to play Stardew Valley. Here are the Top 10 Recommended Games Like Stardew Valley of 2019. Stardew Valley is now available for iPhones and iPads which costs around $7.99. The game is also set to launch on Android very soon. I am an Android user and very excited about it, Are you? Well, the game is very addictive and no other game can match its adventure and exciting gameplay. But if you are looking for games like Stardew valley then you are at right place. Stardew Valley is a role-playing simulation game based on farming. It is a very addictive and fun game to play. The game first appeared in 2016 for the Windows platform and then for Mac OS X, PlayStation 4 and Xbox One. Later, the game launched in 2017 for Nintendo Switch. And recently the game was launched for iOS devices. Finally, Stardew Valley multiplayer is available on PC, MAC, & Linux from August 2018. The multiplayer version is also released for Nintendo Switch on December 12, 2018. The list of the following games is classified according to the platforms so you can easily find it on your platform. One of the most addictive games based on farming from the leading company Gameloft. The animations and graphics in the game are excellent and offer a unique adventure for farming. Green Farm 3 is the best choice for Games like Stardew valley for Android. In the game, we have to complete missions concerning the farms. You can cultivate, cut the crops, feed the animals. Besides, you will get tasks to finish and win cash. You can also sell the products to the market. In general, you have to manage your farms. Another good game inspired by real-life farming skills. Farm Simulation 14 has both Single and Multiplayer Mode so that we can play as we want. In the game, we can use machinery as a real word to manage farms. The game is a Simulation, Action, and Adventure game by GIANTS Software. 3D Graphics in the games makes it more interesting It is also one of the best games similar to Stardew valley for android. Harvest Moon is a Famous game series from which the Stardew Valley inspired. The different games of the series are available for several platforms. The seeds of memory are the only game from series that is available for Android. The game runs only with the devices that have 2GB of RAM or More. If you want to get the game experience that started the age of agricultural games, then you should try. If you’re playing Harvest Moon then you may know about Farmville 2: country escape which is a cool alternative to harvest moon & stardew valley. The list of Games like Stardew valley for Android will not complete without Harvest Moon. 8-Bit Farm is a game for iOS and Android. It is a simulation game where you have to cultivate and manage everything that is under your control. 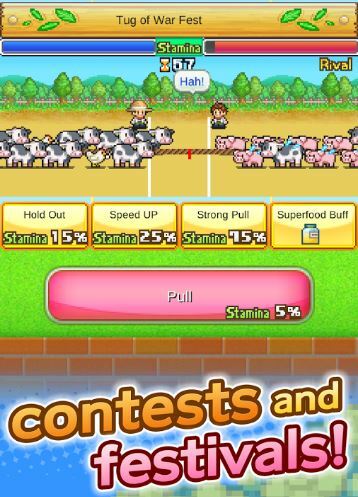 In the game, there are many mini-games that you can play using Animals and Farm Plants. Attract visitors as much as you can by increasing production on the farm. Try the 8-bit farm simulation game, and you will not be disappointed. The game offers an experience like other games like Stardew valley for Android. The simulation game based on the female character named Jennifer raising and managing the farm that is her family farm. Grow food for animals on the farm and sell products on the market. Along with the production of goods, you can also complete impossible missions to obtain prizes. Farm Up deserves to be on the list of Games Like Stardew Valley for Windows. An amazing Simulation, Adventure and farming game. The game is based on a brave and young rancher named Beatrix LeBeau who is far from the earth. She has to manage Slimes and feed to the slimes according to their diet. In the game, you may also have to face some of the dangerous slimes that will drive you crazy. This is a game which is related to games like Stardew valley with better graphics and exciting story mode. World’s Dawn is a simulation, agriculture and adventure game that is full of fun. The game based on agriculture, fishing and other real-life adventures, such as building friendships, finding love, taking care of livestock, competing in festivals and more. The game is very similar to Harvest Moon and Stardew Valley. That’s the reason to add it to Games Like Stardew Valley for windows. Friends of Mineral Town is the game from series Harvest Moon from which the Stardew valley inspired. The Harvest Moon is the game that started the race of agricultural games. The game is one of the best GBA games that you should play. You may be aware of this game, and there are many simulations and farming games under the Harvest Moon series. Visit Harvest Moon Wiki page to know about all the Harvest Moon games. Fantasy Life is a role-playing video game from Publisher named Level-5. It is developed by Level-5, 1-UP Studio and h.a.n.d which results in the best addictive game Fantasy Life. The game is exciting along with its graphics. In the game, you will get to choose the character from lots of different traits and play according to the attribute. You may love to see best NDS emulators for Android so you can play these games. Rune Factory 4 is a Role-Playing and Farming Game. The whole town will be given to you so that you can manage it. At the beginning of the game, you will get a character option like Man and Woman from which you must choose one. In the game, the player loses his memory and has to regain the trust of the villagers in the game. To do that, the player needs to increase the infrastructure of the village to attract and invite tourists in large numbers. I wish you have found what you were looking for in the list of the Games like Stardew Valley to play in 2019. Now it is up to you to choose the game that you like and available for your device. When you find the game that interests you, you can download it or buy it from various sources. she was arguing. Certainly, the blog itself deserves recognition. I’m sure I’ll come back here. I like the valuable information you provide for your articles like Games like Stardew Valley. I’m rather sure I’ll learn much new stuff right here! I only use web for that purpose and get the hottest information. The List of Games like Stardew Valley is Awesome.